On its own, Keystone Lake is a beautiful part of Colorado’s natural landscape. Add 700 hockey players with smiles and full gear, and the lake takes that beauty to a whole other level. 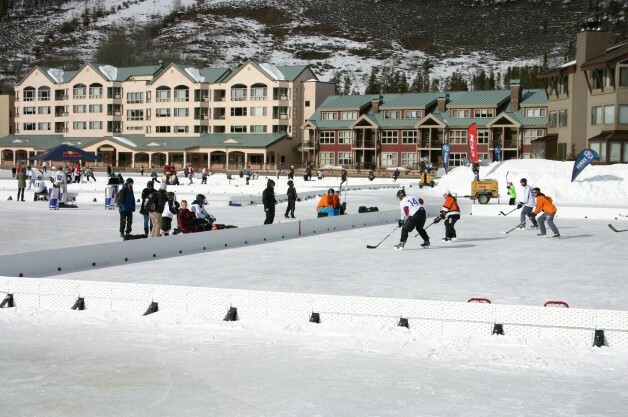 From Jan. 22-24, the second annual 9280 Pond Hockey Tournament and 93 youth and adult teams graced the lake from dawn until dusk – and sometimes longer – inside Keystone Village, which is part of the world-famous Keystone Ski Resort. The event crowned champions in the 8U, 10U, 14U and 18U divisions and featured youth players from as far away as Florida and included rec, A, AA and even some AAA players. The adult divisions crowned champions in the Open, Silver, Bronze, Women’s Open and 45+ divisions and featured players from across the U.S. and Canada, including former players from the Colorado Avalanche and University of Denver and women’s NCAA Division I and professional players. All games were 4-on-4 with no goaltenders in a round-robin format. Each game had two 15-minute, running-time halves with a two-minute break between periods. The rinks were 112 feet long by 64 feet wide with custom-made pond hockey nets. The “9280” in the tournament’s name symbolizes Keystone Lake’s elevation – 9280 feet above sea level, according to Google. In addition to the games, the Avalanche mascot, “Bernie,” and the Avalanche Ice Girls made an appearance. The Colorado Adaptive Sports Foundation was on-hand with the Colorado Sled Hockey Club for an exhibition game. Both Gempeler and Dell felt sled hockey is an important aspect of the hockey community and should be included in the event. “Everyone should get to experience our great game in its purest form – on a frozen lake in the mountains,” said Dell. “You’re pretty gassed putting on an event like that this, but you look out there and see all those smiling faces on the lake and it’s just so worthwhile,” said Gempeler. Teams and players already want to register for the 2017 event. “The Colorado Jr. Eagles brought their entire association this year and now we’re hearing about teams and associations that are blacking out that weekend next year so they can bring all their teams,” boasted Gempeler. “We’ll keep it growing due to the family environment and the family involvement. What a great thing to be able to have a dad who coaches playing in the tourney, with his two kids playing as well, and mom enjoying the beautiful surroundings while spending time with friends and family.